Ah, our pets. We love them. Even when the family dog digs a new hole in the backyard, then joyfully bursts through the door and rolls on the living room carpet leaving a wide swath of fresh, moist mud. Or when the cat presents a freshly-caught rodent or leaves a surprise somewhere because she didn’t like the scent of the new cat litter. Mud, scratch marks, hairballs, pools of urine and other unwanted gift are just par for the course when owning pets. They can be hard on our floors whether tile, carpet, hardwood or vinyl. Before you invest in a new flooring surface, regardless if you’re upgrading your existing flooring, remodeling your home, or renovating a property to sell, here are some flooring options you may want to consider. In addition, we’ve included some helpful tips on protecting and maintaining your flooring, so it continues to show your home at its very best. 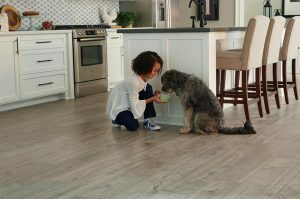 As a general rule, you want a flooring surface that’s easy to clean, resists scratch marks, and provides a level of comfort for the entire family. The good news is that you needn’t sacrifice high-quality or elegant flooring options that will enhance the resale value and overall look of your home. There are numerous options that can do both. Waterproof flooring options that resist scratches and tearing like Luxury Vinyl Tile (LVT), Luxury Vinyl Plank (LVP), Stone Plastic Composite (SPC) and Wood Plastic Composite (WPC) are ideal if you have pets. Luxury Vinyl is 100% waterproof making it a great flooring choice not only for family bathrooms, kitchens, powder rooms, laundry rooms, mudrooms, and entryways but also for those areas where your pets eat and tend to spill water or when they have the occasional upset pet stomach or feel compelled to deliver another surprise. LVT is a luxury vinyl product that looks like stone or ceramic tile, complete with gorgeous natural colors and surface texture that feels like the real thing. LVP is luxury vinyl flooring that resembles wood planks in everything from color to species. Surface textures often include the look of scraping or embossing, which dramatically heighten the realism. Rigid Core Luxury Vinyl flooring, which has a more solid or “rigid” core for added durability. The two types of rigid core Luxury Vinyl are Stone Plastic Composite (SPC) and Wood Plastic Composite (WPC). SPC, Stone Plastic Composite, combines limestone and stabilizers to create an extremely durable core. An SPC floor is 100% waterproof, but adds stability, dent resistance and structure to vinyl plank flooring. WPC, Wood Plastic Composite, has a stable core that includes wood pulp and foaming agents. This gives WPC vinyl a rigid, yet soft feel under foot which means that it’s also comfortable for your pets to tread or rest upon. New York Carpets & Flooring features a variety of elegant and economical Waterproof Flooring options including: Luxury Vinyl Tile (LVT), Luxury Vinyl Plank (LVP), Stone Plastic Composite (SPC) and Wood Plastic Composite (WPC) from SLCC Flooring, Shaw, Mohawk and their manufacturers, Coretec, Pergo, Nexxacore, Parliament, AJ Trading, Eternity, Republic and All-American Hardwood. Engineered hardwood flooring has become increasingly popular over the years, especially in warmer climates because it’s more affordable than traditional hardwood and it’s easier and less expensive to maintain and clean. But some wood flooring is better than others for pets because some woods can still be easily stained by pet urine or other fluids. Some hardwoods will have a urethane coating to further protect it from scratches, pet urine and other harsh liquids. Other hardwoods are also more resistant to scratches from dogs’ nails than others. 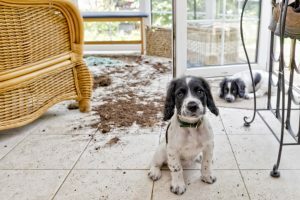 There are also hardwoods that feature a distressed look that can help to obscure the scratch marks left from a dog’s nails better than some smoother wood grain surfaces. 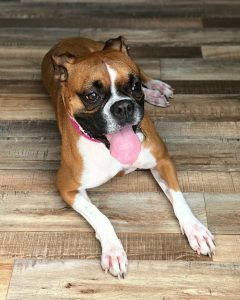 Some of the better durability choices or hardwood flooring for pet owners include Brazilian cherry, white oak, walnut, mahogany, hickory, sycamore, and maple. You may want to avoid many of the softer woods that are also more porous and not as scratch resistant like pine, fir, hemlock, larch, and chestnut. New York Carpets & Flooring features pet-friendly Hardwood Flooring from manufacturers like Shaw Floors®, Anderson Tuftex and Floorte. Laminate flooring has become popular over the years because it simulates the look of real hardwood but is easier to maintain and more scratch-resistant than real wood, which may be your deciding factor in choosing it. 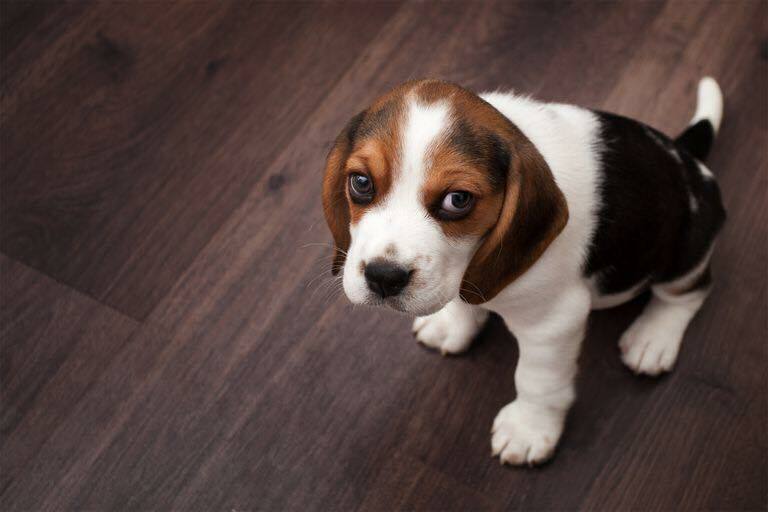 For your dog, however, the only drawback is that they may have a more difficult time getting traction on laminate flooring especially when they get excited or jump up and race down a hallway when the doorbell rings. There are laminates that feature textured finishes helping to reduce slipping but you may also want to provide a dog bed or an area rug in rooms with laminate flooring. New York Carpets & Flooring features a wide variety Laminate Flooring options from SLCC Flooring®, Shaw Floors®, Mohawk Revwood, Solid Tech Republic, All-American Hardwood, AJ Trading, and other manufacturers with the look and feel of real hardwood but more durable and much easier to maintain. Porcelain or ceramic tile flooring can be a great option if you’re concerned about cleaning and maintenance because they are extremely resistance to scratches, water spills and pet accidents. If you live in a dry, warmer climate, a tile floor can also offer a measure of coolness for your pet that other flooring surfaces can’t, especially during the summer months. However, this also means that tile flooring can be uncomfortably chilly for a pet during the winter. 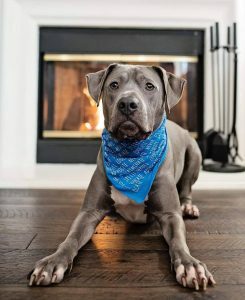 You can address this by including a layer radiant heating mesh beneath the tile when the flooring is installed or more economically by simply tossing down an area rug or a pet bed for your four-legged family member. New York Carpets & Flooring features Porcelain, Ceramic, Glazed Wall Tile, Mosaic Tile, and Paver Tile options from manufacturers like Shaw Floors®, Mohawk Flooring®, Emser®, Eleganza®, Marrazi®, Longust®, Muila®, and Bedrosians®. Carpeting is one of the least expensive flooring options you can make and though it can provide a measure of warmth and comfort for many rooms in your home, it is more difficult to maintain and keep clean and displays dirt and wear from foot traffic much quicker than other flooring types. Typically carpeting is used most often in low-traffic areas like master bedrooms or living rooms if the living room is not the gathering place for the family but used more for infrequent entertaining of guests. If you choose carpeting, you may wish to choose a lower pile to help prevent your pets’ nails or claws from snagging on it. 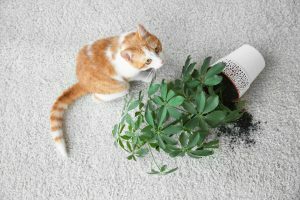 That said, both cats and dogs need to be trained not to attack carpeting either joyfully or from anxiety or frustration and should be provided alternatives like chew toys for dogs or scratching posts for cats. New York Carpets & Flooring features a variety of warm and beautiful Carpeting and Carpet Tile options from Stanton®, Shaw Floors®, Phenix®, Mohawk Flooring®, Karastan®, Kane®, Dreamweaver®, Anderson Tuftex® and other manufacturers. No matter what your style or budget, New York Carpets & Flooring has you and your pets covered!